It has been confirmed that rebels in the Democratic Republic of Congo have recaptured the eastern town of Mushake, which they ceded to the army last week. A BBC correspondent in the area says the rebels are threatening the town of Sake, which is being defended by UN troops, who say they will use force. The army has reportedly suffered heavy casualties during the rebel advance, while civilians are fleeing. The defence minister said the army would regroup to counter-attack. It is the first major setback since the start of the offensive against the insurgents led by Gen Laurent Nkunda. Sake is on the main road to the regional capital, Goma. "They've reached the limit. If they try to go further, if they fire towards us, we will open fire," Major Prem Tiwari, a spokesman for the UN mission in DR Congo (Monuc), said, according to the AFP news agency. "We have a mandate to protect the population and Sake town. We will not allow them to move beyond their current positions." The government admits the rebels have also retaken positions in a nearby village, Karuba. A BBC reporter, who is close to the frontline, has seen hundreds of wounded. Our reporter says amid the newly displaced civilians, there are many children who have been separated from their parents. An estimated 400,000 people have had to flee their homes in the last few months. Monuc is ferrying in tonnes of munitions and flying out the wounded troops. BBC Africa analyst Martin Plaut says the Congolese offensive, launched last week after months of planning, appears in disarray just days after they were trumpeting a "major victory" over Gen Nkunda's force. Observers suggest this is a major setback, not only for President Joseph Kabila whose soldiers have not been up to the task, but also for the UN, which so publicly committed itself to the government advance. DR Congo's Defence Minister Diemu Chikez told AFP that what appeared to be a rout of the armed forces was a "retreat in order to regroup". "The insurgents launched a surprise attack. We pulled back and they retook Mushake and Karuba, but this won't last," he said. It is arguable that neither side can hold on to any territorial gains - and that is of far more serious consequence to President Kabila's armed forces than to the rebels, who can employ hit-and-run tactics, our correspondent says. Human Rights Watch has appealed for all sides to protect those caught up in the fighting. Mushake was taken only a week ago, and represented a step taken into rebel territory. 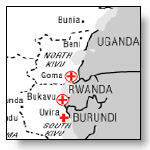 The town overlooks the road to Goma, and the government hoped that controlling it would demonstrate it could protect the ethnic Tutsi population, which Gen Nkunda claims to defend against marauding Rwandan Hutu rebels who have lived in eastern DR Congo since the Rwandan genocide in 1994. The government had repeatedly warned him to stop his rebellion and integrate his men into the army. The US has urged the rebel leader to go into exile in order to end the fighting, but his spokesman has denied reports that he had agreed.